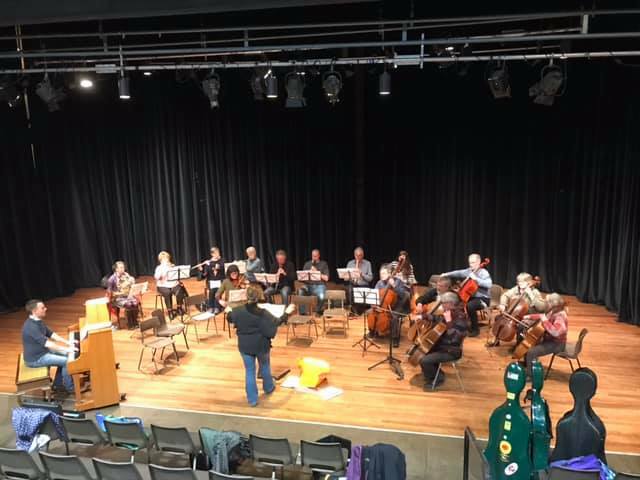 A new instrumental ensemble for adults held in Caernarfon, the Caernarfon Community Orchestra held its very first rehearsal on Tuesday the 5th of March. Under the direction of the cellist, Nicki Pearce from Colwyn Bay and with Steven Evans, originally from Caernarfon as répetiteur the Community Orchestra meets on Tuesday evenings from 8:00pm – 9:15pm at Theatr Seilo in Caernarfon. Sixteen members attended the first rehearsal with another 3 joining the second week. This new venture is organised by Canolfan Gerdd William Mathias which is based at Galeri Caernarfon and provides high quality music tuition, as well as organising a variety of community events throughout Wales. “Nicki Pearce and I had been discussing for a while the possibility of establishing an orchestra that would provide opportunities for adults to come together, to socialise and enjoy creating music. One member that enjoyed the first rehearsal was Gwyneth M Davies from Benllech that plays Bb Cornet. Since the first rehearsal more members have now joined and a warm welcome awaits any other new members wishing to join the orchestra. A new series of Caernarfon Community Orchestra will begin on the 9th of April. To register and for more information members are encouraged to contact Canolfan Gerdd William Mathias (01286 685 230 / post@cgwm.org.uk).